22 km north of Merritt, B.C. Taking Nature's Pulse: Section 1: Primer on Biodiversity: Importance and History in B.C. Taking Nature's Pulse: Section 3: Threats to Biodiversity in B.C. Editors: M.A. Austin, et al. Cf. P.
Suggested citation: Austin,M.A., D.A. Buffett, D.J. Nicolson, G.G.E. Scudder and V. Stevens (eds.). 2008. Taking Natures Pulse: The Status of Biodiversity in British Columbia. Biodiversity BC, Victoria, BC. 268 pp. Available at: www.biodiversitybc.org. Cover photos: Jared Hobbs (owl); Laure Neish (bee on yellow flower); Duan Zidar (orange peel fungus); Ian McAllister (kermode); Robert Koopmans (salmon); Karen Wipond (landscape); Jennifer Heron (checkerspot); Arifin Graham (footprints in sand). Banner photos: Frank Leung (p. v); Vera Bogaerts (p. 1); Karoline Cullen (p. 5); Jared Hobbs (p. 23); Robert Koopmans (p. 155); Jennifer Heron (p. 213). 1.2 Why Is Biodiversity Important? 2.3.4.3 Migratory Species in B.C. Appendix A. Historic species in B.C. Appendix B. Major taxa of extant, native, free-living terrestrial and freshwater organisms in B.C., with tabular summary of the availability of up-to-date species checklists, handbooks or systematic monographs, computerized geo-referenced distributional databases, and local (British Columbia) taxonomic/systematic expertise. Text Box 16 - The Mountain Pine Beetle Epidemic in B.C. Table 1 - Areal extent of biogeoclimatic zones in B.C. Table 2 - Conservation status ranks for ecosystems in B.C. Table 3 - Conservation status of biogeoclimatic zones in B.C. Table 4 - Distribution of species of conservation concern in B.C. by biogeoclimatic zone. Table 5 - Proportion of global range classification for ecosystems and species. Table 6 - Distribution of biogeoclimatic zones across B.C. and neighbouring jurisdictions. Table 7 - Provincial conservation status of ecological communities in B.C. by biogeoclimatic zone. Table 8 - Historical loss of grassland ecosystems in the Okanagan Valley between 1800 and 2005. Table 9 - Provincial conservation status of Major Drainage Areas in B.C. Table 10 - Habitat types used in B.C. biophysical ShoreZone mapping. Table 11 - Number of species considered for the analyses of species richness, conservation status, proportion of global range and realm overlap, by taxonomic group. Table 12 - Conservation status ranks for species in B.C. Table 13 - Summary of B.C. species assessed for global and provincial conservation status. Table 14 - Extinct and presumed extirpated species in B.C. Table 15 - Conservation status for B.C. vertebrate, invertebrate and vascular plant species associated with the terrestrial, freshwater and marine realms. Table 16 - Summary of B.C. species by global range class. Table 17 - Species of provicial or global conservation concern with a majority of their global range in B.C. Table 18 - Terrestrial and freshwater species in B.C. that overlap with the marine realm. Table 19 - Number of vertebrate species of provincial conservation concern in B.C. that are shared with adjacent jurisdictions, as well as those that have a majority of their global range in B.C. Table 20 - B.C. endemic taxa below the species level that are of provincial conservation concern. Table 22 - Extinct and extirpated taxa below the species level in B.C. Table 23 - Selected key elements of biodiversity in B.C. Table 24 - Selected special elements of biodiversity in B.C. Table 25 - Area of terrestrial ecosystem conversion in B.C. since European contact. Table 26 - 2003 provincial overview of top 10 human activities impacting biodiversity in B.C. Table 27 - Agricultural land use within the Greater Vancouver Regional District between 1981 and 2001. Table 28 - Percent of land logged in B.C. since the 1970s by biogeoclimatic zone. Table 29 - Presence of roads or other linear features in B.C. by biogeoclimatic zone. Table 30 - Surface water allocation in B.C. by Major Drainage Area. Table 31 - Density of oil and gas sites in B.C. by biogeoclimatic zone. Map 1 - Roads or other linear development features present above and below 1,000 m.
Map 2 - Biogeoclimatic ecosystem classification zones. Map 3 - Biogeoclimatic zones of conservation concern. Map 4 - Biogeoclimatic zones for which B.C. has the majority of the global range. Map 5 - Major Drainage Areas. Map 6 - Species richness. Map 7 - Species richness: species of global conservation concern. Map 8 - Species richness: species of provincial conservation concern. Map 9 - Species richness: species with a majority of their global range in B.C. Map 10 - Area of forests more than 10% impacted by mountain pine beetle. Map 11a. - Special elements: species. Map 11b. - Special elements: ecosystems. Map 12 - Terrestrial ecosystem conversion (%). Map 13 - Number of terrestrial and freshwater alien species. Map 14 - Seasonal trends in precipitation from 1971 to 2000. Map 15 - Seasonal trends in minimum temperature from 1971 to 2000. Map 16 - Seasonal trends in maximum temperature from 1971 to 2000. Map 17 - Absolute rate of change in minimum temperature (average of all months) from 1971 to 2000. Map 18 - Relative change in minimum temperature (average of all months) from 1971 to 2000. Map 19 - Logged since the 1970s (%). Map 20 - Density of roads and other linear development features (km/km2). Map 22 - Oil and gas site density (sites/km2). Figure 2 - Conceptual pyramid of levels of organization of biodiversity. Figure 3 - Colour morphs of the American black bear. Figure 4 - Patch size requirements vary by species. Figure 5 - Services derived from biodiversity that support human well-being. Figure 6 - First Nations languages of British Columbia. Figure 7 - Land cover types in B.C. as percent of total land area. Figure 8 - Loss of Idaho fescuebluebunch wheatgrass ecosystem in the Okanagan Valley since 1800. Figure 9 - Loss of antelope-brush / needle and thread grass ecosystem in the Okanagan Valley since 1800. Figure 10 - Past and present distribution of Garry oak ecosystems of southern Vancouver Island and the Gulf Islands. Figure 11 - Status of streams in the Lower Fraser Valley in 2007. Figure 12 - The intertidal zone. Figure 13 - Locations of mapped estuaries in B.C. Figure 14 - The interface between the freshwater plume and the saltwater wedge. Figure 15 - Species of global conservation concern as percent of total number of plant and animal species assessed in B.C. Figure 16 - Species of provincial conservation concern as percent of total number of plant and animal species assessed in B.C. Figure 17 - Species of global and provincial conservation concern in the terrestrial, freshwater and marine realms. Figure 18 - Species and subspecies with changed conservation status in B.C. since the 1990s. Figure 19 - Species with a majority of their global range in B.C. as a percent of the total species assessed. Figure 20 - The three major ice-free refugia from which freshwater fish recolonized British Columbia. Figure 21 - Distribution of the three ecotypes of woodland caribou in B.C. Figure 22 - The hidden majority. Figure 23 - Potential loss of fish habitat owing to stream crossings that block fish passage. Figure 24 - Relationship between riparian areas and terrestrial and freshwater species. Figure 25 - Loss of water birch / roses riparian shrub wetland in the Okanagan Valley since 1800. Figure 26 - Distribution of natural disturbance types in B.C. Figure 27 - Forests in B.C. affected by mountain pine beetle, with projections to 2018. Figure 28 - Loss of black cottonwood / water birch riparian shrub ecosystem in the Okanagan since 1800. Figure 29 - The relationship between salmon returns, bears, riparian forests and future salmon productivity. Figure 30 - Historic and current species richness for 17 carnivore and ungulate species that have undergone significant range contractions in North America. Figure 31 - The biodiversity threat framework. Figure 32 - Impact of stresses on elements of biodiversity. Figure 33 - Streams allocated to human uses, 1950s2001. Figure 34 - Alien vascular plant and freshwater fish species in B.C. Figure 35 - Trends in shellfish beds closed to harvesting in British Columbia, 19892006. Figure 36 - Impact of human activities on elements of biodiversity. Figure 37 - Projected mean annual temperature change for the 2020s, 2050s and 2080s for three climate change scenarios. Figure 38 - Projected mean annual precipitation change for the 2020s, 2050s and 2080s for three climate change scenarios. Figure 39 - Climate envelopes for biogeoclimatic zones in B.C. : current distribution and projected distribution (2085). Figure 40 - Potential shift in biogeoclimatic zones by 2085 due to climate change. Figure 41 - Total timber harvest, 19122005/06. Figure 42 - Population growth for B.C. (18612006) with a projection to 2031. Figure 43 - B.C. population change, 19812001. Figure 44 - Change in impervious area in the Georgia BasinPuget Sound region, 19922000. Figure 45 - Length of roads in B.C. in 1988, 2000 and 2005. Figure 46 - Trends in surface water licensing in B.C. British Columbia is a spectacular place, known worldwide for its natural beauty and diversity. The provinces ecosystems provide habitat for a vast array of plants and animals and have sustained human populations for at least 10,000 years. Although we continue to derive huge benefits from these natural systems, their true value and significance is not fully understood. Nor do we fully understand the potential threats to the environment caused by our expanding human footprint. This report, Taking Nature's Pulse: The Status of Biodiversity in British Columbia, is a comprehensive, sciencebased assessment of the provinces natural environment. Its purpose is to assist British Columbians in making informed choices regarding biodiversity. The scope of the report is B.C.s terrestrial and freshwater realms, including their overlap with the marine realm. Taking Nature's Pulse was developed by Biodiversity BC, a partnership of government and non-government organizations with a mandate to produce a biodiversity strategy for British Columbia. Scientists both provincial and international played a key role in shaping and building the report through the preparation of technical background reports and peer reviews of the report as it was being drafted. The report has four main sections. Section 1 provides background on biodiversity, including its attributes, importance and history in B.C. Section 2 describes the current status of B.C.s ecosystems, species and genetic diversity, and key and special elements. Section 3 outlines the threats to biodiversity. Section 4 presents the major findings of the assessment. Taking Nature's Pulse does not assess existing conservation programs and policies in B.C. or compare approaches taken in B.C. with those in other jurisdictions. Nevertheless, there is a wide range of conservation tools that have been employed by governments, industry, conservation organizations and the public in British Columbia. Examples include protected areas, covering more than 14% of the province; conservation areas, including Wildlife Management Areas, Wildlife Habitat Areas and Old Growth Management Areas; land management guidelines and regulations; private land conservation; and strategic land use plans with land use designations and resource management objectives designed to address biodiversity concerns. Biodiversity is short for biological diversity -- the variety of life in all its forms. It includes genes, species and ecosystems, and the processes that link them, an ensemble that many people think of simply as Nature. Biodiversity provides important ecosystem services to all living things, such as regulating climate and the flow of water. It also fulfills basic human needs, providing us with essentials like food and clean water, supplies the natural capital upon which our economy depends and satisfies a wide range of recreational, spiritual and cultural needs. British Columbia's glacial history, mountainous terrain, proximity to the Pacific Ocean and widely varied local climates have shaped its biodiversity. For at least 10,000 years, the First Peoples in British Columbia have relied on biodiversity, building a wealth of specialized knowledge about its uses and inner workings. Since the arrival of Europeans, biodiversity has continued to play a vital role in the provinces development. An ecosystem is a community of organisms and their physical environment. Ecosystems are complex, dynamic and adaptive systems that are continuously evolving. When they become simplified through the loss of component parts or processes, they lose their ecological resilience -- the ability to withstand and adapt to natural or human-caused disturbances. Ecosystems can be defined and assessed at a range of scales from the very small -- for example the organisms and processes occurring in a small pond -- to the very large such as the coastal temperate rainforest, extending along the Pacific coast from northern California to Alaska. The primary scale used in this report for terrestrial ecosystems is biogeoclimatic zones, which are broad geographic areas sharing similar climate and vegetation. Within B.C. there are 16 biogeoclimatic zones: 12 forested, three alpine and one grassland. The finest scale used in the report is ecological communities. To date, 611 ecological communities have been described in the province. Major Drainage Areas were used as the basis for broad-scale analysis focusing on freshwater ecosystems. Water from the entire province runs into nine Major Drainage Areas, feeding large rivers like the Fraser, Skeena, Taku and Peace, and ultimately flowing into either the Pacific Ocean or the Arctic Ocean. The Fraser River alone drains roughly one-quarter of the province. Freshwater and terrestrial ecosystems overlap with the marine realm in estuaries and intertidal zones. Both of these overlap areas are naturally rare, but are highly productive and important for biodiversity in all three realms. 1. 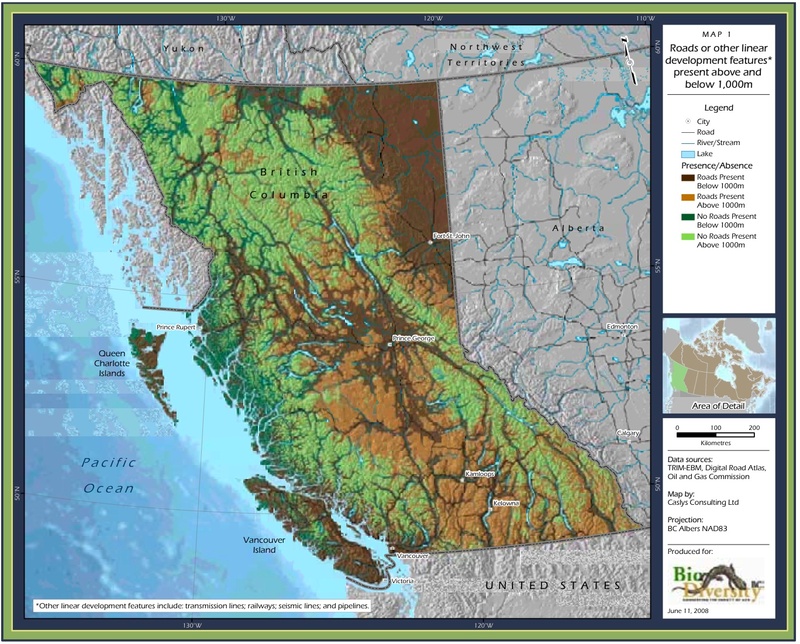 At the broad scale, four biogeoclimatic zones [Coastal Douglas-fir, Interior Douglas-fir, Ponderosa Pine, and Bunchgrass], representing approximately 5% of British Columbia's land base, are of provincial conservation concern. 2. At the fine scale, more than half of the ecological communities described in British Columbia are of provincial conservation concern. 3. British Columbia has a majority of the global range for six of the 16 biogeoclimatic zones that occur in the province [Coastal Douglas-fir, Interior CedarHemlock, Montane Spruce, Mountain Hemlock, Sub-boreal PineSpruce, and Sub-boreal Spruce]. 4. The Coastal Douglas-fir biogeoclimatic zone is the rarest biogeoclimatic zone in British Columbia and is of great conservation concern. 5. Low-elevation grassland communities are the rarest land cover type in British Columbia and are concentrated in the biogeoclimatic zones of conservation concern [see Major Finding 1]. 6. Significant areas of wetlands in British Columbia have been converted or degraded, particularly in the two Major Drainage Areas of greatest conservation concern [those of the Columbia River and Fraser River]. 7. Estuaries are of concern in British Columbia because of their rarity and the level of human impacts to them. Species are genetically distinct groups of organisms that are capable of successfully interbreeding. Each species is a unique part of nature. Of all the Canadian provinces and territories, B.C. is home to the richest diversity of vascular plants, mosses, mammals, butterflies and breeding birds, and the largest number of species of reptiles, tiger beetles and amphibians found only in one province or territory. More than 50,000 different species (not including single-celled organisms) exist in B.C., but only about 3,800 of these have been assessed for their conservation status. Some parts of the province (primarily unroaded and unsettled areas) have not been surveyed and some taxonomic groups remain largely unstudied. 8. Of the species assessed to date in British Columbia, 43% are of provincial conservation concern and these are concentrated in the four biogeoclimatic zones of conservation concern [see Major Finding 1]. 9. British Columbia is known to have a majority of the global range for 99 species. Genetic diversity is the foundation of biodiversity. Genes are the functional units of heredity and genetic variation that permit species to adapt to changing environments. B.C. has a disproportionately high level of genetic diversity relative to its species diversity. The provinces glacial history, complex topography and varied climate have contributed to the evolution of a wide variety of adaptations to different environments. As a result, many species occur in the province as geographically distinct subspecies, which differ from each other in appearance, environmental tolerances and/or behaviour, which reflect differences in genetic make-up. For example, there are more than 400 genetically distinct populations among five species of Pacific salmon in B.C. This variability has allowed salmon to use all available stream systems in the province, adding to their ability to adapt to changing conditions. Due to B.C. 's large size and biophysical variability, the province is home to many species that are at the edge of their range. Such populations are often genetically distinct from populations at the core of the species range. B.C. also has a high density of hybrid zones that contribute to genetic diversity in both terrestrial and fresh-water ecosystems. In these zones, landscape change and historic expansion and contraction of species ranges have created conditions where individuals from genetically different populations or species interbreed, pro-ducing new genetic combinations. 10. British Columbia has a high level of genetic diversity within species, which is critical for adaptation and resilience. Key elements are the species and ecosystem components, and the processes performed by them, that have a fundamental or disproportionate influence on how ecosystems function. Taking Nature's Pulse highlights a sample of the key elements that are important for biodiversity in B.C. An important example of a key element is pollination, which is the transfer of pollen between plants by animals or by non-biological forces such as wind. The majority of animal pollination is carried out by insects such as bees, beetles, wasps, flies, butterflies and moths. One-third of the food consumed by people is a result of pollination by animals. Special elements are components of biodiversity that are uncommon and, in some cases, found nowhere else in B.C. Examples include: seasonal concentrations of species, such as rookeries where Steller sea lions gather to breed; special communities, such as temperate rainforests and intact large mammal predator-prey systems; and noteworthy features, including karst cave systems, hot springs, saline lakes and fishless lakes, all of which are inhabited by rare and specialized species. As with the key elements, the list presented in this report is not all-inclusive. 11. The flow of water in lakes, streams, wetlands and groundwater systems is being seriously impacted in British Columbia by dams, water diversions, logging, stream crossings and climate change. 12. The natural disturbance processes that shape British Columbia's forests [e.g., wild fire, insects] are being disrupted by human activities. 13. British Columbia's mainland coast features a number of interconnected key and special elements of biodiversity: intact temperate rainforest, an intact large mammal predator-prey system, glacially influenced streams and salmon-driven nutrient cycling. 14. The majority of British Columbia has intact or relatively intact predator-prey systems, but a major threat to them is motorized access and associated human activities. 15. British Columbia has many significant seasonal concentrations of species [e.g., migratory birds, spawning salmon] that are vulnerable to human impacts. Biodiversity is under threat around the world. According to the 2005 Millennium Ecosystem Assessment more than half of the earths grasslands, forests, rivers and lakes have been degraded, along with their ability to perform essential ecosystem functions and support life. Similarly the World Conservation Union (IUCN) has ranked 40% of the 40,000 species it has evaluated as being threatened with extinction. With each species that is lost, so too is its potential to contribute to the production of food, fuel, building materials, pollination, decomposition, filtration and other services needed to maintain life on the planet. While British Columbia faces many of the same threats that are occurring globally, its biodiversity is in relatively better shape due to the shorter history of large-scale human development and the provinces mountainous terrain. However, current trends indicate that threats to B.C. species and ecosystems are increasing. species mortality (the direct killing of individual organisms). Ecosystem conversion, ecosystem degradation and alien species are the most significant stresses on biodiversity in B.C. and globally. The human activities that contribute most significantly to the stresses on biodiversity in B.C. are associated with climate change, agriculture, recreation, urban and rural development, forestry, transportation and utility corridors, oil and gas development and water development. Other activities that have important impacts on biodiversity are grazing, industrial development, mining and aquaculture. Within B.C., human activities are generally concentrated in areas of high biodiversity, particularly along rivers, in estuaries and in fertile valleys. While it is logical to look at the impacts of these activities individually, losses to biodiversity generally result from a combination of stresses. These cumulative impacts can affect biodiversity at a magnitude that is greater than the sum of the individual impacts. The impacts of climate change on biodiversity are already being felt and it is expected to be the greatest overriding threat to biodiversity in the future, especially in areas of the province where biodiversity is already affected by ecosystem conversion, ecosystem degradation, alien species and other stresses. Precisely how eco-systems and species will respond to climate change remains unknown. The speed with which species adapt to, or move in response to, changes in conditions will likely determine whether they thrive or disappear, and will in turn influence ecosystems. Where ecosystems are already degraded or fragmented by activities such as construction of roads and associated stream crossings, habitat connectivity may be lost, preventing many species from shifting their ranges in response to the changing climate. 16. Ecosystem conversion from urban/rural development and agriculture has seriously impacted British Columbia's biodiversity, especially in the three rarest biogeoclimatic zones [Coastal Douglas-fir, Bunchgrass and Ponderosa Pine]. 17. Ecosystem degradation from forestry, oil and gas development, and transportation and utility corridors has seriously impacted British Columbia's biodiversity. 18. Alien species are seriously impacting British Columbia's biodiversity, especially on islands and in lakes. 19. Climate change is already seriously impacting British Columbia and is the foremost threat to biodiversity. 20. The cumulative impacts of human activities in British Columbia are increasing and are resulting in the loss of ecosystem resilience. 21. Connectivity of ecosystems in British Columbia is being lost and, among other impacts, this will limit the ability of species to shift their distributions in response to climate change. There is a substantial and ever-growing body of knowledge about biodiversity in British Columbia, which includes scientific publications, species checklists, computer databases and individual expertise. However, there is also much that is not known. Capacity refers to the ability to fill the many knowledge gaps and integrate new and existing information. Thousands, if not tens of thousands, of species in B.C. have not been scientifically described or are not documented as being present in the province. Species groups for which such information is particularly lacking include most of the invertebrates and non-vascular plants. This taxonomic knowledge gap is currently being exacerbated by an 'extinction of experience' as the scientists with the knowledge, skills and inclination to do the work required to fill the gaps are retiring and often are not being replaced. The majority of species in B.C. have not been assessed for their conservation status and the global ranks for many species that have been assessed are out of date. The ecology of most species and the distributions of all but a very few are poorly understood. Coarse-scale ecosystem classifications are complete in B.C., but information at a finer ecosystem scale is incomplete, as is ecosystem information from neighbouring jurisdictions. Trend monitoring is extremely limited and data on distribution and population size are lacking for many species. Information about impacts on biodiversity is generally incomplete or out of date. 22. Gaps in our knowledge of biodiversity in British Columbia create major challenges for effective conservation action. 23. The capacity to address some of the gaps in our knowledge of biodiversity in British Columbia is being impacted by the loss of already limited taxonomic expertise. All life is part of biodiversity and each living thing depends on a multitude of species, ecosystems and ecological processes for its existence. Throughout the province there is compelling scientific evidence that biodiversity is being significantly altered by individual and cumulative stresses resulting from human activities. Climate change is an overriding impact that is already taking a toll on B.C. 's biodiversity and is expected to become an increasingly significant threat. Trend data for B.C. show that declines in biodiversity are occurring at the genetic, species and ecosystem levels, critical ecosystem processes are being impacted and key and special elements of biodiversity are being lost. Meanwhile, major gaps in our knowledge of the provinces biodiversity hinder our ability to understand and respond to this situation. British Columbia's biodiversity is globally significant because of its variety and integrity, but without immediate action, it is vulnerable to rapid deterioration, especially in light of climate change. Assessing the status of 'life in all its forms' for an entire province is no simple task. It was made possible only by the enormous contributions of time, expertise and hard work by the dozens of people who participated as scientific experts, reviewers, consultants and committee members. Biodiversity BC would like to thank the following people for their assistance in making Taking Nature's Pulse: The Status of Biodiversity in British Columbia a reality and ensuring that it is as accurate and comprehensive as possible. The Biodiversity BC secretariat supports the work of the Steering Committee and the Technical Subcommittee and provides ongoing strategic advice. The secretariat consists of Stuart Gale, executive director, and Janet Fontaine, coordinator. Victoria (Tory) Stevens, B.C. Ministry of Environment. Liz Williams (B.C. Ministry of Agriculture and Lands). The Status of Genetic Biodiversity in British Columbia: Amy Wilson, Peter Arcese and Fred Bunnell. First Nations consultant: Frank Brown. October 2005 Conceptual Framework Workshop: Jacky Booth (Consultant), Fred Bunnell (UBC, Emeritus), Michael Dunn (EC), John Harper (Coastal and Ocean Resources Inc.), Dave Huggard (Consultant), Glen Jamieson (DFO), Ken Lertzman (SFU), Eric Parkinson (MoE), Ian Perry (DFO), Tony Pitcher (UBC), Jason Smith (SFU), Art Tautz ( MoE), Amanda Vincent (UBC), Bill Wareham (DSF). Reed Noss (University of Central Florida) was unable to attend, but provided a review. October 2005 Terrestrial Workshop: Carmen Cadrin (MoE), Brian Klinkenberg (UBC), Ken Lertzman (SFU), Andy MacKinnon (MoFR), Del Meidinger (MoFR), Marlow Pellatt (PC), Jim Walker (TNT). November 2005 Freshwater Workshop: Doug Biffard (MoE), Ted Down (MoE), Malcolm Gray (ILMB), Richard Hebda (UVic/RBCM), Blair Holtby (DFO), Craig Mount (MoE), Eric Parkinson (MoE), Sue Pollard (MoE), Art Tautz (MoE), Dave Tredger (MoE). November 2005 Marine Workshop: Jackie Alder (UBC), Jamie Alley (MoE), Kimberly Anthony (EC), Jeff Ardron (Consultant/ Pacific Marine Analysis and Research Association), Natalie Ban (UBC), Jacky Booth (Consultant), Cathryn Clarke (DFO), Chris Close (UBC), Ken Cripps (Coastal First Nations - Turning Point Initiative), Steve Diggon (DFO), Melody Farrell (DFO), Larry Greba (Coastal First Nations - Turning Point Initiative), Edward Gregr (UBC), Joy Hillier (DFO), Doug Hrynyk (PC), Sabine Jessen (CPAWS), Greg Kapala (LOS), Greg Kehm (Ecotrust Canada), Jamie Kenyon (EC), Jennifer Lash (LOS), Greg MacMillan (PC), Murray Manson (DFO), Jack Mathias (DFO), Krista Munro (LOS), Joe Truscott (MoE), Tony Turner (NRCAN), Scott Wallace (Consultant), Bruce Ward (MoE), Bill Wareham (DSF), Louisa Wood (UBC), Mark Zacharias (ILMB). February 2006 Science Workshop: Peter Arcese (UBC), Fred Bunnell (UBC, Emeritus), Don Eastman (UVic, Retired), Jim Irvine (DFO), Phil Lee (PC), Del Meidinger (MoFR), Eric Parkinson (MoE), Ian Perry (DFO), Art Tautz (MoE). April 2007 Ecosystem Status Workshop: Carmen Cadrin (MoE), Dave Clark (MoE), Dennis Demarchi (Consultant), Andrew Harcombe (NCC), Will MacKenzie (MoFR), Eric Parkinson (MoE), Art Tautz (MoE), Adrian Walton (MoFR). June 5, 2007 Science Workshop: Martin Carver (MoE), Shane Ford (MoE), Gerry Fox (OGC), Bruce Fraser (FPB), Laura Friis (MoE), Linda Gilkeson (MoE), Stewart Guy (MoE), Ted Lea (MoE), Kaaren Lewis (MoE), Eric Lofroth (MoE), Remi Odense (MoE), Sue Pollard (MoE), James Quayle (MoE), David Tesch (MoE), Richard Thompson (MoE), Mark Zacharias (ILMB). Carmen Cadrin (MoE) was unable to attend, but provided a review. June 12, 2007 Science Workshop: Peter Arcese (UBC), Doug Biffard (MoE), Fred Bunnell (UBC, Emeritus), Ted Down (MoE), Don Eastman (UVic, Retired), Andrew Harcombe (NCC), Trish Hayes (EC), Richard Hebda (UVic/RBCM), Kim Hyatt (DFO), Phil Lee (PC), Kathy Martin (UBC), Don McPhail (UBC, Emeritus), Eric Parkinson (MoE), John Richardson (UBC), Risa Smith (EC), Art Tautz (MoE), Eric Taylor (UBC). August 2007 Aquatic Essential Ecosystem Characteristics Workshop: Doug Biffard (MoE), Tom Johnston (MoE), Richard Hebda (UVic/RBCM), Kim Hyatt (DFO). August 2007 Terrestrial Essential Ecosystem Characteristics Workshop: Peter Arcese (UBC), Richard Hebda (UVic/RBCM). December 2007 Major Findings Science Workshop: Peter Arcese (UBC), Don Eastman (UVic, Retired), Andrew Harcombe (NCC), Richard Hebda (UVic/RBCM), Kim Hyatt (DFO), Andy MacKinnon (MoFR), Don McPhail (UBC, Emeritus), James Quayle (MoE), Eric Taylor (UBC). January 2008 Major Findings and Objectives Science Workshop: Rachel Holt (Consultant), Susan Pinkus (Ecojustice), John Reynolds (SFU), Risa Smith (EC), Eric Taylor (UBC). February 2008 Major Findings and Objectives Science Workshop: Doug Biffard (MoE), Carmen Cadrin (MoE), Martin Carver (MoE), Don Eastman (UVic, Retired), Gerry Fox (OGC), Andrew Harcombe (NCC), Richard Hebda (UVic/RBCM), Kim Hyatt (DFO), Don McPhail (UBC, Emeritus), Trevor Murdock (PCIC), James Quayle (MoE), David Tesch (MoE). Safety Net Gap Analysis Survey (February 2007): Marian Adair (TNT), Peter Arcese (UBC), Doug Biffard (MoE), Ken Brock (EC), Carmen Cadrin (MoE), Ted Down (MoE), Dave Fraser (MoE), Laura Friis (MoE), Andrew Harcombe (NCC), Richard Hebda (UVic/RBCM), Glen Jamieson (DFO), Chris Johnson (University of Northern British Columbia), Alan Kenny (PSF), Jan Kirkby (EC), Ted Lea (MoE), Don McPhail (UBC, Emeritus), Eric Parkinson (MoE), Marlow Pellatt (PC), Chris Ritchie (MoE), Val Schaefer (UVic), Risa Smith (EC), Liz Stanlake (HCTF). Participating TSC members: Dan Buffett, Matt Austin, Tory Stevens. Peer Reviewers - Component Reports: Doug Biffard (MoE), Carmen Cadrin (MoE), Glyn Fox (MoE), Jenny Fraser (MoE), Richard Hebda (UVic/RBCM), Crawford S. Hollings (University of Florida), Angela Kingerlee (MoE), Ted Lea (MoE), Ken Lertzman (SFU), Andy MacKinnon (MoFR), Don McPhail (UBC, Emeritus), Dave Nagorsen (Consultant), Gordon Orians (University of Washington, Emeritus), Ian Perry (DFO), John Reynolds (SFU), John Richardson (UBC). Peer Reviewers - October 2007 Draft Status of Biodiversity Report: Marilyn Anions (NatureServe Canada), Peter Arcese (UBC), Doug Biffard (MoE), Andre Breault (EC), Fred Bunnell (UBC, Emeritus), Rob Butler (EC), Carmen Cadrin (MoE), Martin Carver (MoE), Orville Dyer (MoE), Don Eastman (UVic, Retired), Wendy Easton (EC), Bob Elner (EC), Laura Friis (MoE), Stewart Guy (MoE), Andrew Harcombe (NCC), Trish Hayes (EC), Richard Hebda (UVic/RBCM), Ole Hendrickson (EC), Rachel Holt (Consultant), Jim Irvine (DFO), Tom Johnston (MoE), Elsie Krebs (EC), Ted Lea (MoE), Ken Lertzman (SFU), Eric Lofroth (MoE), Don McPhail (UBC, Emeritus), Trevor Murdock (PCIC), Reed Noss (University of Central Florida), Ian Perry (DFO), Susan Pinkus (Ecojustice and on behalf of DSF, ForestEthics, Sierra Club of Canada [BC Chapter] and WCWC), Sue Pollard (MoE), Hugh Possingham (University of Queensland), James Quayle (MoE), John Reynolds (SFU), Carmen Revenga (The Nature Conservancy - Worldwide Office), Art Tautz (MoE), Eric Taylor (UBC), Richard Thompson (MoE), Ken Vance Borland (Conservation Planning Institute), Jim Walker (TNT), Leanna Warman (UBC). Peer Reviewers - February 2008 Final Draft Status of Biodiversity Report: Candace Batycki (ForestEthics), Shannon Berch (MoFR), Fred Bunnell (UBC, Emeritus), Don Eastman (UVic, Retired), Deepa Filatow (MoE), Dave Fraser (MoE), Andrew Harcombe (NCC), Richard Hebda (UVic/RBCM), Don McPhail (UBC, Emeritus), Susan Pinkus (Ecojustice and on behalf of DSF, ForestEthics, Sierra Club of Canada [BC Chapter] and WCWC), Jim Pojar (Consultant), Eric Taylor (UBC). Biodiversity BC Steering Committee, Technical Subcommittee. Biodiversity Bc Partner Groups: The Nature Trust of British Columbia, B.C. Ministry of Environment, B.C. Ministry of Agriculture and Lands, Ducks Unlimited Canada, Nature Conservancy of Canada, Environment Canada, Habitat Conservation Trust Foundation, Metro Vancouver (representing the Union of British Columbia Municipalities), The Land Conservancy of British Columbia, Pacific Salmon Foundation, Canadian Parks and Wilderness Society (representing environmental non-governmental organizations). In 2005, Biodiversity BC (a partnership of governments and non-government conservation organizations) was given the mandate to develop and facilitate the implementation of a science-based biodiversity strategy for British Columbia. A number of reports have been developed to support this process (see below). This report, Taking Nature's Pulse: The Status of Biodiversity in British Columbia, summarizes the current scientific knowledge about the state of biodiversity and threats to biodiversity in British Columbia, derived from the best available scientific data and expert opinion. Taking Nature's Pulse is the result of two years of consultation by Biodiversity BC with more than 100 scientists and other experts. Between fall 2005 and spring 2006, a series of expert workshops was held to gather input on approaches to developing a biodiversity strategy, including the preparation of a science-based status report. In February 2006, the Technical Subcommittee (TSC) of Biodiversity BC was formed to coordinate the development of a status report. Members of the TSC include scientists and technical practitioners from partner organizations, including the B.C. Ministry of Environment, Ducks Unlimited Canada, Nature Conservancy of Canada and The Nature Trust of British Columbia. 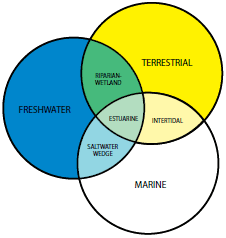 Figure 1: Spatial overlap of the terrestrial, freshwater and marine realms. Shading indicates the scope of this report. Sources: Fraser, D.F., A. Banner and A. Harcombe. 1995. A Framework for Ecological Classification in British Columbia. report. 27pp. ; and Mackenzie, W.H. and J.R. Moran. 2004. Taking Nature's Pulse considers threats to biodiversity due to human impacts following European contact. It addresses the status of the full range of terrestrial and freshwater biodiversity in the province, as well as the overlap between the marine realm and both the freshwater and terrestrial realms, as shown in Figure 1. The full range of marine biodiversity is not addressed in this report, as the assessment of the marine realm was identified to be within the mandate of Fisheries and Oceans Canada.b Species that are solely marine, such as whales and marine phytoplankton, are not included. Although there are currently a wide variety of conservation tools and measures in place to conserve biodiversity in B.C., Taking Nature's Pulse does not attempt to provide an assessment of these. Its purpose is to describe the current condition of biodiversity and related threats from human activity. An assessment of the extent to which management tools have proven to be effective in maintaining biodiversity is something that can better be done in the context of determining future priorities and actions for biodiversity conservation. a In collaboration with many partners, Biodiversity BC has led the development of Hectares BC (www.hectaresbc.org), a web application that allows users to access, and do analyses on, map-based information relevant to biodiversity conservation. b See Pacific Ocean status reports at: www.pac.dfo-mpo.gc.ca/SCI/psarc/OSRs/Ocean_SSR_e.htm. Examples of current conservation tools in British Columbia include protected areas, which cover more than 14% of the province; conservation areas, including Wildlife Management Areas, Wildlife Habitat Areas and Old Growth Management Areas; land management guidelines and regulations; private land conservation; and strategic land use plans, which include land use designations and resource management objectives. Governments, industry, conservation organizations and the public all participate in implementing these measures. Section 1: A Primer on Biodiversity provides definitions and context for the discussion of biodiversity in British Columbia. It addresses three key questions: What is biodiversity? Why is biodiversity important? What are the elements that characterize B.C. 's biodiversity? Section 2: British Columbia's Natural Legacy is the core of the report, summarizing the current status of ecosystems, species and genetic diversity and key and special elements. It identifies areas of overlap with the marine environment and with other jurisdictions. Section 3: Threats to Biodiversity in British Columbia examines the factors that are currently driving the loss of biodiversity in British Columbia. Section 4: Major Findings represents a synthesis of the assessment presented in Sections 2 and 3 and serves as the foundation for the development and implementation of priorities and actions. References are cited by number (e.g., 3) and provided in order at the end of the document. Footnotes are indicated by letter (e.g., a) and provided at the bottom of the relevant page. All glossary terms are highlighted in green when first used in the body of the text and defined in the glossary, which begins after Section 4. Scientific names are given only with the first mention of a species within the body of the text. There are two types of maps in this report: full-page provincial maps taken from the Atlas, and smaller maps from a variety of sources. The smaller maps are considered figures and are numbered sequentially as part of the list of figures in the table of contents. The full-page Atlas maps are listed separately in the table of contents. For the Atlas maps that illustrate analyses, the analysis units are the result of an overlay of biogeoclimatic zones/subzones/variants, ecosections and third-order watersheds. There are 72,335 analysis units in the province, ranging in size from 1 to 1,530 ha. Most of the full-page maps consist of a main map and a smaller, inset map, which present the same data in two different ways. The main map uses ten percentile classes, each of which generally incorporates the same number of analysis units.a In effect, one-tenth of the analysis units are in each percentile class no matter what range of values that represents. For example, if an analysis unit has a road density that is greater than or equal to 60% of the other analysis units, it is in the 60th percentile. The inset maps mostly use an equal-interval approach, in which the data are divided into 10 equally spaced classes, where each class may contain a different number of analysis units. For example, the road density values range from 0 to 22.1 km/km2, so the first class contains all analysis units with a value between 0 and 2.21 km/km2, the second class contains all analysis units with a value between 2.22 and 4.42 km/km2, etc. These two cartographic approaches for presenting data were used to meet three sometimes conflicting goals: following consistent mapping methods; allowing for comparisons between maps; and accurately representing the distribution of data values, while showing spatial variation within B.C. a The exception to each percentile class having the same number of analysis units occurs when there is a tie between the values for a particular measure in two or more analysis units; for example, when a large number of units have a value of 0 for a given measure. British Columbia is an exceptional place, known worldwide for its spectacular landscapes and remarkable wildlife. The province's mountainous topography, glacial history and ocean-influenced climate have fostered a wide diversity of ecosystems and an incredible abundance of life. Of all the Canadian provinces and territories, B.C. is home to the richest diversity of vascular plants, mosses, mammals, butterflies and breeding birds, and the largest number of species of reptiles, tiger beetles (Cicindela spp.) and amphibians found only in one province or territory.1 Some species - such as the Vancouver Island marmot (Marmota vancouverensis), Macoun's meadowfoam (Limnanthes macounii) and at least eight south Okanagan insect species - live nowhere else in the world. Others, like the mountain goat (Oreamnos americanus)2 and mountain caribou (Rangifer tarandus caribou mountain ecotype),3 have a majority of their population in B.C. Several sticklebacks (Gasterosteus spp.) that are found only in a few small B.C. lakes are considered scientific treasures because of the genetic insights they offer.4 Examples of important biological diversity or biodiversity also abound at the ecosystem level. For instance, the province shares the world's only inland temperate rainforest with Idaho, Montana and Washington,a and, along with Alaska, is home to most of the remaining intact coastal temperate rainforest. Human activities are altering the landscape of B.C. in ways that compromise components of the province's biodiversity. An increasingly large proportion of the province is roaded (Map 1) and the human population has grown to over four million, with 80% concentrated in urban centres in the lower mainland, on Vancouver Island and in the interior near Kamloops and Kelowna; by 2031, B.C. 's population is expected to reach close to six million (see Sec. 3.3.4, p. 196). Urbanization has replaced large areas of low-elevation natural ecosystems with impervious surfaces such as concrete and pavement, and agriculture has converted biologically diverse forests, wetlands and grasslands to pasture and crops. Resource extraction places a variety of pressures on biodiversity, particu- larly through ecosystem conversion and ecosystem degradation, environmental contamination and species disturbance, while other human activities impact biodiversity through direct species mortality and introduction of alien species. Recently, changes in climate as the result of human activities have begun to affect biodiversity in the province in unprecedented and often unpredictable ways. a Depending on how the inland temperate rainforest is defined, the entire global range of this ecosystem may be contained within B.C. (see Section 2.5.2.2-A, p. 141). Nevertheless, British Columbia still has wild places and is considered to be globally important to the con- servation of many species and ecosystems. Its rugged terrain and short industrial history, which began with the arrival of European explorers 200 years ago, have limited human activity in much of the province. As a result, sensitive species and ecosystems that have been lost elsewhere are still found in B.C. Biodiversity, however, is more than just the sum of its parts.5 Species and ecosystems are connected through numerous natural processes. All elements of biodiversity, regardless of whether we understand their roles or know their status, play a role in maintaining functioning, evolving, resilient ecosystems. Maintaining the integ- rity, evolutionary potential and resilience of our natural systems will facilitate their ability to adapt, particularly in the face of rapid climate change. Biodiversity supplies a host of benefits and services that are essential to the well-being of humans and non-humans alike. This natural capital, which depends on maintaining native species and ecosystems and the functions they perform, supports the high quality of life British Columbians have come to enjoy. a See "About This Report" (p. XXVII) for an explanation of analysis units. For details of methods, see The Biodiversity Atlas of British Columbia, available at: www.biodiversitybc.org.